We've been enjoying mild, springlike weather these past days, which is a great change to the icy weather we had till the beginning of March. flea-market which is situated in old train halls behind the main railway. And I fell in love with that HMV dog! There was also a cafe there, with very individual furnishings, but I will show that in my TSFT Post! I am in love with your tulips. They certainly speak spring to me. They are fabulous, and it was good to see a little bird with them, too. Loved seeing those sunrise shots, but the flea market really impressed me. I liked the chandeliers that hung from the rafters in the first few shots. Although I was impressed with a few places, I also liked that booth that was your favorite. I loved the old globes, the dog, the suitcases, and the kitsch. Thanks for taking me with you. What an interesting flea market with all those beautiful things to buy! Love your Spring creation with the gorgeous tulips! Great captures of the sunrise and spectacular colors! Wishing you a lovely day and a happy week!Hugs! 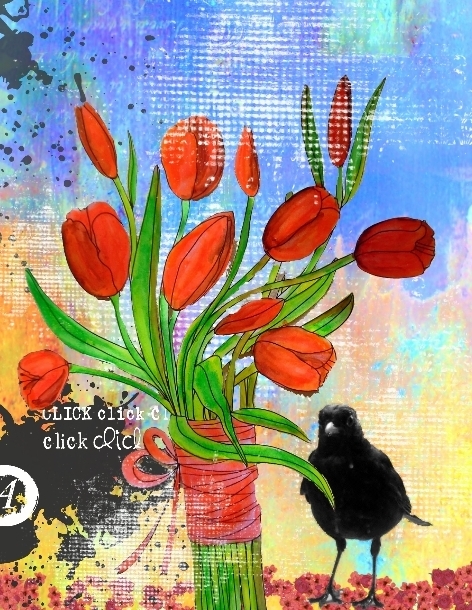 Love the tulips with the blackbird! That flea market looks very inviting! Gorgeous spring page, glad the weather has improved. I love flea markets great photos. I always enjoy seeing your art work and your photographs. I'm glad for your tulips as we're expecting another round of snow. The sunrise pictures are gorgeous! I'm painting an sunrise picture and your photos are such an inspiration. The flea market looks like lots of fun. I especially loved the booth with all the cobalt blue crockery. The HMV dog's name is Nipper. He was the trademark logo for the RCA Corporation. And his little buddy, Chipper is with him, too. How cute! Did you take Nipper home? That looked a fun day out - chandeliers certainly were unusual. wie schön dein Bild mit den Tulpen!!! der Fohmarkt ist in diesen alten Eisenbahnhallen immer toll ich war damals einmal noch drinnen bevor ich umgezogen bin. Der Sonnenaufgang ist ja wundervoll, du hast wunderschönes sonniges warmes Wetter! Ich wünsche dir noch einen schönen Reststonntag! 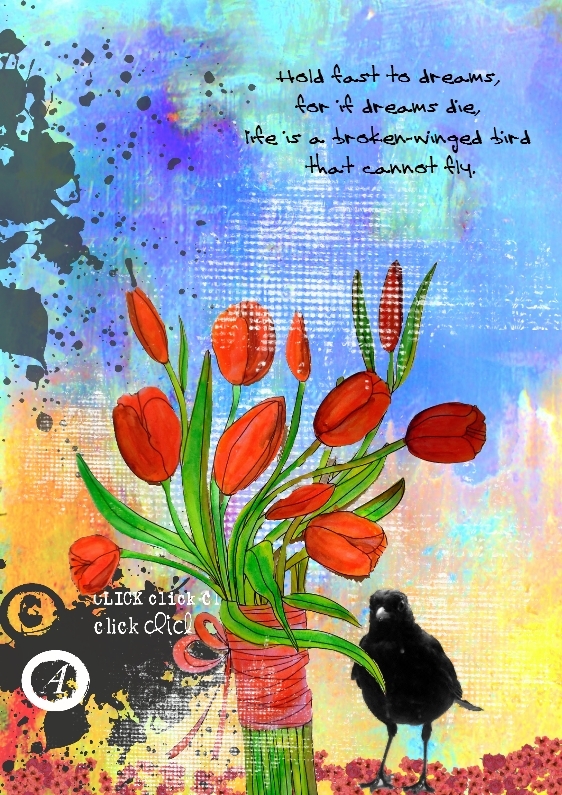 beautiful spring page,so wonderful looks the red tulips with the black bird.love it so much! the photos of the flomarket looks super,many old beautiful things there is. What a great flea market, and in old train halls on top of it! I love the setting and judging from the photos I would have found quite some things there. Good thing it's so far away. As a child I often went to Neuss because my cousins lived there and I stayed for a week and then later one of them would stay for a week at our place. Nice memories! Your Spring art is refreshing and I love the quote you used too. I also love a good flea market ♥ I've been without a computer for over a week now so I am very far behind on everything :( Hopefully it is all good now and I don't have to buy a new one. Dein Tulpengruß sieht sehr schön aus liebe Valerie und die Sonnenaufgangsphotos sind ein Traum, immer wieder anders und schön. Die Flohmarktimpressionen sehen verlockend aus, da wäre ich auch gerne durchgelaufen. Der kleine Hund hätte mir auch gefallen und dieser Kristall-Leuchter auch. Liebe Grüße und schöne neue Woche. A beautiful bunch of tulips and a great quote on your fantastic spring page. The photos from your visit to the Flea Market look awesome, my kind of destination, with loads to see and look at. Were you tempted to take something home with you? I look forward to seeing your photos of the Cafe. I was tempted, but didn't give in - I already have too much! What a gorgeous page, Valerie! And I love your beautiful sunrises! I am glad you had great time at the Flea Market. Kisses, my friend. I just love your mixed media piece but that flee market is amazing! I love flea markets and all the wonderful treasures that you can find. Thank your for sharing the photos. The booths are permanent. There is room in between for people who want to sell things occasionally, too. Your tulips are so bright and cheery, they make me smile. And that market makes me smile, too. Oh, it's a good thing I wasn't there -- my luggage would be way over limit on my return home! Gorgeous tulips Valerie! They appear so lifelike!! Thank you for taking us to the flea with you! How much fun! What a beautiful building to house the market! What did you buy?? Can't wait for more! So happy the temperatures are getting better for you! I love your Spring art piece! Great quote! Gorgeous pictures! Love that market for shopping! How fun! I love that dog too! Big Hugs! Sweet spring greeting and photos! Such a cool flea market! Lots of fun looking through those goodies!